혼합폐플라스틱과 폐타이어분말을 혼합하여 복합체를 구성하고 그 기계적인 물성을 조사하였다. 수지-고무분말 사이의 계면접착력을 증대시키고자 두 요소와 친화성을 가질 것으로 예상되는 trans-octylene rubber(TOR)를 소량 첨가하였다. 고무분말의 투입량이 많아질수록 인장강도와 압축강도는 플라스틱자체보다 저하되었으며 파단신장률과 충격강도는 증가되었다. 상용화제 TOR이 첨가되면 인장강도와 충격강도 및 압축강도는 크게 향상되었으나 신장률은 변화가 없었다. 이러한 물성의 변화는 TOR의 화학적인 이중성에 기인한다고 여겨진다. Mechanical properties of the commingled waste plastics filled with ground rubber tire were studied. To improve adhesion at the interface, trans-octylene rubber(TOR) was added. 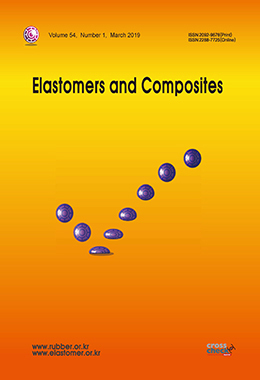 With increasing the rubber level, first, due to their inherent incompatibility, the tensile and the compressive strength decreased but tensile strain and impact strength increased. Then, as TOR added, the samples showed still the same strain but the tensile, impact, and compressive strength as well increased markedly. Variation of the properties by addition of TOR seemed to be attributed to the dual character of TOR.